A few weeks ago Ryan and I visited his grandparents in Tulsa, Oklahoma. It was shortly after Halloween and, like any good grandma, Nanny sent us home with an absurd amount of candy. Of course, like any good grandchildren, we happily accepted! 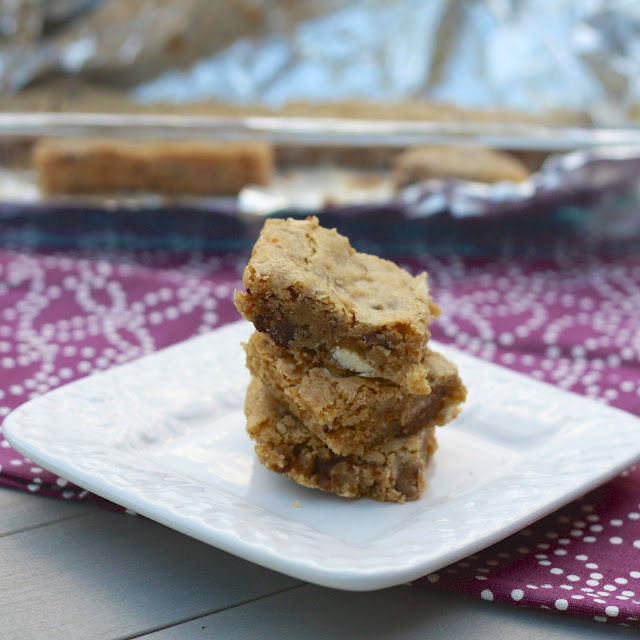 These blondies were my solution to the handful of Kit Kat bars in our variety bag of candy. I used a blondie recipe from the America’s Test Kitchen cookbook, but swapped out their mix-ins for some chopped candy bars and white chocolate chips. Our community group devoured the plate of these, squashing my fears that they wouldn’t go over well (totally unjustified, I just thought they seemed pretty basic). 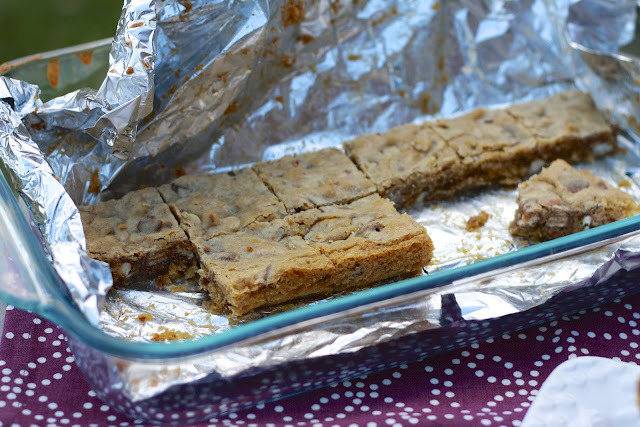 My friend Mike managed to eat three before his wife Maggie pointed out they were cookie bars. Turns out Mike claims to like cookies, but not cookie bars. I think it’s safe to say he’s changed his stance on cookie bars! The blondie base is perfect, a blank canvas for just about anything you want to add. If you aren’t still hiding a bag of Halloween candy in your dresser drawer (what? Just me?) 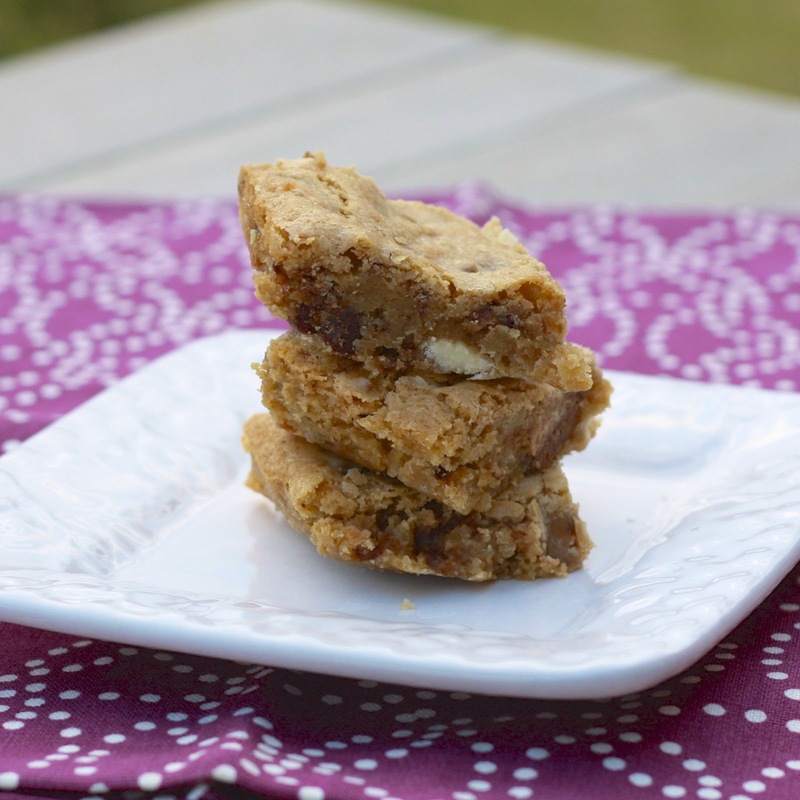 , add any combination of nuts or chocolate chips or dried fruit! 1. Heat oven to 350F. Line a 9 x 13 inch pan with foil and coat with cooking spray. 2. In a medium-sized bowl, whisk together the flour, baking powder, and salt. Set aside. 3. Whisk the brown sugar and butter together in a medium bowl until combined. Whisk in the eggs and vanilla. Stir in the flour mixture, just until combined. Stir in the Kit Kats and white chocolate chips. 4. Spread batter evenly into prepared pan. Bake for 22-25 minutes, until an inserted toothpick comes out clean. Cool on a wire rack until room temperature before slicing and serving. Bars will keep at room temperature for 3-4 days, wrapped in an airtight container.